You don't have to look far to see what's new. In fact, you may have already noticed when you logged in. 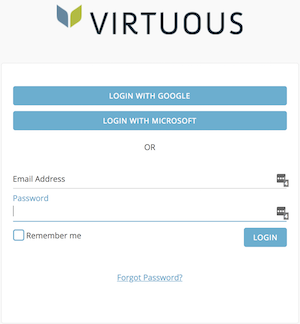 On the Virtuous login screen, Virtuous now supports single sign on using your existing Google or Microsoft account. The Giving by Project Widget in the Contact screen header has been given a nice facelift. Now, users will be able to view the top five Projects a Contact has given to. Click on the three dots icon to customize the widget by selecting a specific time frame. Have you ever created an Automated Workflow and wished that you could set a specific value on a Contact custom field as one of the actions? Well, wishes do come true! 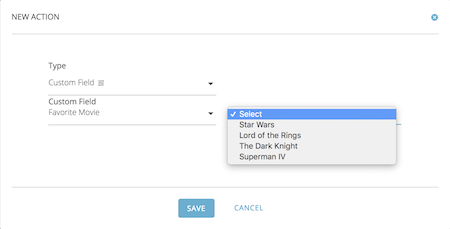 When adding an Action to a workflow, select "Custom Field" from the list of Actions and you'll be in business. Well, worry no more. Admin users can define new Project Roles for their organization, which can be used to connect Contacts to Projects, much like relationships can be used to tie two Contacts together. 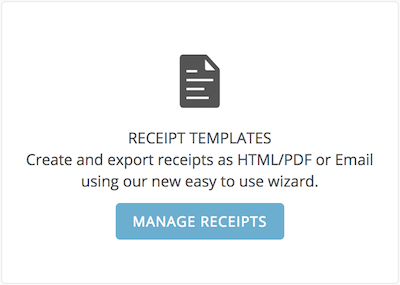 And of course, the new feature we teased in our last message: we've got a brand-new receipting tool! We know that not every organization has an HTML whiz on staff, so customizing everyday receipt templates can be daunting. With that in mind, we've been hard at work on a new tool that will allow users who are not so comfortable with HTML to create receipt templates easily. As a bonus, the same editor can now be used to generate monthly, quarterly, or annual giving statements. These new receipt templates can be used to send receipts directly from the results of a Gift query, just as regular receipts are sent today. For more on creating and managing receipt templates, check out our support article on creating templates.